Hi I'm Tia, and I recently rescued "Maveric" He's a 10 y.o. YFA. He needed a new forever home because his cage mates ended up attacking him and plucked him (previous owner's didn't realize the other 2 had became a mated pair, so Mav wasn't welcome) He might not look great to some people right now, but I'm a proud parront and I think he's extremely handsome. Right now he's still getting used to his new flock here so my pictures will just be of him until he's comfortable. I look forward to reading post and eventually joining in on the other post. Welcome to the forum, Tia and Maveric, and thank you so much for taking in a bird that might not look perfect to some people but which looks beautiful to anybody who loves them -and, here, we all do! Now, I have to tell you that the plucking pattern he has is not one of having another bird plucking him but of self-plucking. A bird that is not happy with another bird would not pluck the other bird's chest, it would go for its head and back while self-plucking would affect chest, belly and legs mostly [although there are birds that pluck their entire body, too] so, although I am not calling the previous owner a liar because stranger things have happened, it's highly unlikely that he is not plucking himself. Ergo, if I were you, I would part from that premise and work accordingly on his [was he DNA'd a male?] diet [low protein, low fat so no free-feeding ANY type of protein food] and a VERY strict solar schedule with, at least, 2 hours of both dawn and dusk. Also, try daily morning baths but only if he is used to them and do not stress him out because pluckers can't take any unnecessary stress. Thank you for the welcome Parajita. Yes he is DNA male, and yes his diet was basically seed and occasionally a few dried fruits and salted peanuts. So I'm in the process of switching him to pellets and adding fresh fruits and veggies every day. And the salted peanuts are no longer allowed. And since I have a 9 month old who has decided he likes table foods better than his baby foods sometimes so Maveric will get a side dish of baby fruits and veggies added to his daily feedings. I bought him some unsalted saltine crackers and he gets them as a special treat if he's being extra good. I'm using them along with his favorite fresh fruit for working with him to learn to step up, he'll only step up out of his cage to a perch. But if he flies off the play stand or T stand and lands on my desk he'll step up onto my forearm and sit with me for a few minutes, then he usually gets the extra cracker lol. And he always gets all of his treat foods directly from mine, my husband or our daughters hands, we don't just put them in his bowls.This way he's learning also that he's safe and can trust us. I'm not sure what type of solar schedule they had him on before I got him but he's on one now, although the first few days/ nights he wasn't a very happy camper. and screamed when I put him to bed and screamed some more when I got him up the next morning. I can't say that the previous owners told me the truth about why or how he ended up plucked but I haven't seen him pluck himself at all and I clean his cage daily and there aren't any feathers in or around his cage, play or T stand. And since I'm a stay at home mom I'm with him all day and have never seen him pluck. So it's really hard to say how or why he ended up that way. But I am aware that some birds can and do stress pluck, I was lucky and became the forever home to a goffin and that was bald when I got him, and he was the only pet in the home. And a B&G which was so bad she basically had no wings, and no tail and was naked across most the rest of her body , so yes they can pluck themselves to that extreme. And although neither of them fully feathered back they did both get a lot better at not plucking just by learning what caused them to trigger and then removing that & distracting them with something else to pluck and shred. It just takes time to learn for them and us. You should have no problem at all getting him to eat produce because amazons are all great eaters. It's just a matter of persistence with them. Personally, I don't feed pellets. 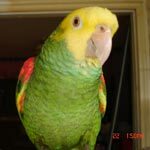 I've been caring for parrots since 1992 and have been doing research on their natural diets for over 20 years and have long ago reached the conclusion that pellets are not and never will be the best dietary option for them and I'll tell you why. 1] They are too dry -parrots natural diets are between 85 and 95 pct moisture, pellets are a max of 10 and we have learned [from cats diets] that feeding a diet so much lower in moisture to an animal will cause kidney issues in the long run because these animals are not hard-wired to drink enough to make up for the difference. Some parrots actually dunk the pellets in water, the poor things, but not all do. 2] With the except of Tops, they are all made out of animal feed ingredients. 3] With the exception of Tops, they all contain soy, a known allergen, goitrogenic and estrogenic. 4] They are all 'dead' food -no phytonutrients, no enzymes. 5] None of them tell you how much protein you are feeding because every single one of them is 'Minimum protein', never an exact figure. 5] All the vitamins are man-made in a lab. 6] Not all of them but the worst ones ] have sugar [a complete no-no with birds because they never eat in the wild to the point that nature did not even gave them taste buds for it!] and artificial coloring and flavoring. As to your problems with the solar schedule... well, maybe you are not exposing him fully to dawn and dusk because, when you do, they wake up and go to sleep on their own without a single problem [it's what nature evolved them to do]. Now, don't take this the wrong way but, if I were you, I would not allow a child to offer a male amazon food with her fingers because they tend to get aggressive when hormonal even when you do keep them at a solar schedule and are doing everything right. I have a pair in the birdroom, they live cage-free, are fully flighted, kept at a super strict solar schedule, feed a fresh food diet daily, have full spectrum lights overhead, etc. and, when it's breeding season, my husband cannot go into the room unless they are caged because, if he does, the male will actually fly down to attack him. And even I, his known and trusted caregiver of years, have to be careful with him because, when I am not, I end up with holes from his bites. In truth, I only allow my grown children and grandchildren to interact with one single bird: Codee, my female GCC which is the sweetest, sweetest thing - and I still closely supervise all the time, just in case. Last edited by Pajarita on Wed May 09, 2018 9:02 am, edited 1 time in total. Thank you for all of your knowlegdable advice that you've gained in the last 20 some years. I guess I'm at a loss due to the fact that I've only been handling and raising parrots for the past 40 years??? So before this becomes a debate I will just say farewell and good luck. But on a side note, I would like to say a couple of things first. Your profile list that you have 30 birds and have recently rescued 2 other new ones which puts you up to 33. Now from my brief experience and from some of your own personal post to other members. I'm curious as to exactly how each of them are getting the care and attention that each of them require? Too's and quakers are both extremely known for being attention hounds by themselves and can be clingy even on a good day, so where are you finding the extra time to give them that? Also if you are that experienced you would know that you NEVER bring new birds right into your original flock, they should always be quarantined until they are settled and their health has been verified by an avian vet so that you don't expose your other birds to anything that the new bird could possibly be carrying that is unknown, and cause an outbreak of sickness or death in all of the birds. Tia, I am sorry you were so offended by my posting, I was not meant that way and I will be sorry to see you go but, if that is what you want, all you have to do is not come back because, as far as I know, membership is only revoked when you break the rules. Not everybody likes our site... we are very science-oriented here and love debates because the truth is that, although we have learned a lot about parrots in the last 20 years, we still don't know anywhere near enough so exchanging opinions and experiences is a way for all of us to learn more. But we are definitely not a place for everybody as there are people who, for whatever reason, don't like debates and prefer belonging to what I call a 'fluff bird site'. Now, as to the concerns you mention... I actually have a grand total of 34 birds right now since two days ago because my contractor brought me a pair of budgies belonging to his girlfriend because the female has an overgrown beak from a bad diet and I offered to treat her, switch her to a good diet and teach his girlfriend how to continue the 'maintenance treatment' before I return them to her. You are absolutely right that I did not allow enough time between the new caique and the quaker because I got Javi in October and the quaker came a few weeks ago - and I do quarantine birds that I don't have any background on but I've known Javi since he was an unweaned baby [plus, he came with an avian vet's health certificate -for whatever that is worth which is not much] and the quaker is 4 years old and has lived her entire life without contact with another bird. Granted that this doesn't mean that they are not asymptomatic carriers but, if they are, quarantine would not have shown anything that would indicate the danger of contagion either. But, aside from the quarantine issue, I am always telling people to allow enough time between birds so as to give them enough time to find what I call 'their place in the flock' before a new one joins but, sometimes, opportunities come up and we need to make do as best we can. Thankfully, Javi Caique is a very well adjusted bird that got used to me and his new home in record time, and I am happy to report that Keku Quaker is doing wonderfully! In the few days that she has been here, she has eaten raw produce she never ate before and gotten used to eating gloop, her wings have gotten stronger and she has become more daring in her flights [she now flies across the kitchen to the dining room and from the dining room to the other end of the living room ], she doesn't scream at all -which was the main reason why she was rehomed- and is still the sweetest thing -granted that she is still in her honeymoon period but I am keeping my fingers crossed [she is perched on my shoulder right now, preening my hair and repeating "Watchadoing?' every time I ask her ] You are right that birds require personal attention on their own but the dynamics are different when you have one or two birds of completely different species than when you have a number of them interacting with each other - and I do spend almost my entire day with them [7 children are all grown and with families of their own -12 grandkids, I don't work and my husband spends 4 and 5 days a week out of state so my entire life revolves around my birds [and, as soon as I can find a housekeeper who loves animals, I won't even have to clean house - YAAAAYYYYY! ]. So I do have the time for them but, in truth, my birds simply do not need humans as much. They still love us to pieces and have access to as much love and interaction with humans as they want [they are out of cage and flying around from 5:30 am to 2 pm this time of the year] but they have other things going for them because they are not 'single children' and completely dependent on a human for attention and entertainment - plus, they are NEVER overly hormonal [the main reason for birds like toos to cling 24/7/365]. I would also imagine that a breeder's birds would not be able to achieve that kind of interaction so your concern is understandable... My parrots are mostly in pairs [something that I strive to give all of them because I believe that a mate or companion bird of their own species enriches their life in a way that nothing else can] and that helps tremendously. I have two bonded pairs of amazons, a pair of parrotlets, a pair of senegals, a little flock of budgies, a female GCC that is bonded to a male peach front conure, a male cockatoo that loves the female CAG, a male and female ARB which are not yet bonded but for which I still have hope [and they both belong to the 'poi flock' and chill with the senegals], the single caique and the single quaker - and I will, eventually, look for mates for them, too - if I have to. And I say this because I've been noticing that they are both going into each other's cages and sharing produce on top of them so I might end up with another interspecies pair. I know the quaker is female but I still have to DNA the caique which will take some time because I always get extra blood taken for this when they get their physical and he/she had one in October [before he came to me] so it's too soon for another visit to the vet and I am not going to put him/her through any unnecessary stress. The rest of the birds are canaries, finches, button quails and a male red crested cardinal [a highly territorial species so no mate is necessary] which do not require any human interaction at all. People tend to think that a single pet bird is the same as a bird that lives in household with other birds but it's not true. As a matter of record, I have been handling parrots for longer than the 24 years I've been doing in-depth research on their diets. I was born and raised in a South American country where we have parrots and my grandmother raised babies sold in the farmers market to release back into the wild once grown since I was a baby [I hand-raised my first one when I was ten years old, under her direct supervision, of course] so you could say that I grew up with parrots. And because of this, I thought I knew all there was to know about them, when, in reality, I did not know anything - so I ended up making A LOT of mistakes. These mistakes as well as what I have learned from study and experience is what I share here. And you say that you raised parrots for 40 years - WOW! That's a lot of years and I would imagine A LOT of birds bred for the pet trade... You also mention a pet goffin and a B&G which, apparently, you no longer have and were kept at different times so it seems to me that your experience is not the same as mine and it's a shame you do not want to come back to compare notes but, it is, of course, your prerogative so, if you don't, I wish you and your new bird the best of luck! Welcome to the forum. I have 13 birds. None are caged even though they have a cage for when they sleep at night. I have had birds for many years and joined this forum in 2011. I found out that I really knew nothing about my birds and have been taught through this forum. Sometimes I pick up on a word in a post and run with it. Sometimes toes get stepped on but I am only responding for love of the birds. I thought I knew birds but have been taught a lot through this forum. Pajarita and others have stepped on my toes a few times but it is only for the love of my birds. Please do not take offense. This is only for love of the birds. My babies are in "Rambo, Myrtle & Cockatiels".